This is what started this thought process of favourite things today. I think Gamvar may well become one of my top favs! I noticed this varnish on-line a few months ago but couldn’t find it in the whole of Perth. After much searching, I put a call through to one of our local art stores, Kendall’s Art Supplies and explained what it was. They had not heard of it (we are a bit behind the eight ball here in Perth!) but they tracked it down in Sydney for me. It took two weeks to track over the Nullabor and it has taken another two weeks for me to crack it open and give it a go. Verdict? BRILLIANT! 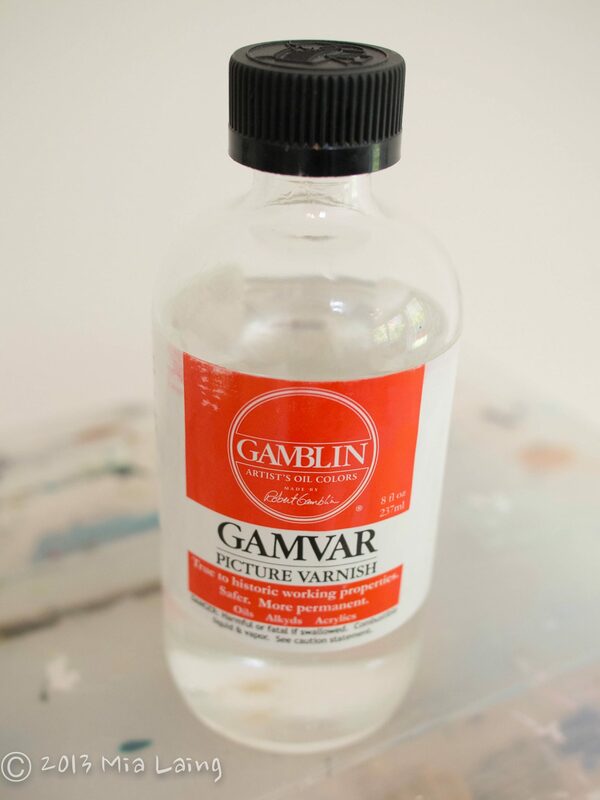 Finally, a varnish that you can use over oil paintings as soon as they are touch dry. No waiting for 6 months. This varnish is permeable enough to allow for the natural oil curing process and so can be applied once the painting is touch dry without causing cracking. Great news for a thin layer painter like me! Apparently I can apply it after two weeks, though I think I will leave it at least 6 to 12 weeks to be sure…damn better than the 6 months I have been waiting! Another bonus is that this varnish is practically odourless…no brain rot. I’ve varnished 4 paintings this weekend…so, so easy and stress free! Happy days. Kendalls Art Supplies, Northbridge. roughly $30 for 250ml bottle, expensive, but I barely used a cm on 4 paintings!! 2. Baby Oil – Home brand, any supermarket. In keeping in with the no brain rot policy, I use baby oil instead of toxic solvent (turps) for cleaning my brushes. I keep a big basket of clean rags in my studio (ripped up, threadbare sheets make for brilliant cloth) I use a piece of this cloth, or paper towel to wipe most of the oil off my brushes. When most of the oil is wiped off, I dip the paintbrush into a container of baby oil. I then wipe the brush onto the rag or paper towel and repeat the dipping and wiping until there is very little paint residue left behind on the rag or paper towel. 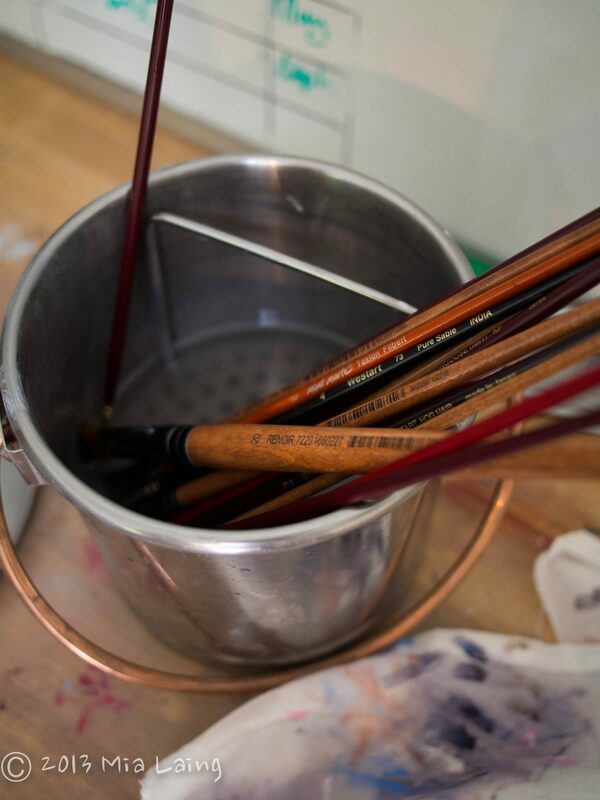 I then take my brushes into the laundry and give them a clean with a brush cleanser or with soap and water to make sure there is no oil left on the brush for the next paint session. I have a stainless steel pot that I half fill with the baby oil, that is especially designed for brush cleaning. It has a mesh tray at the base of it that prevents the brushes coming into contact with the sludge or slurry of old oil paint that sinks to the bottom of the pot. I bought it at Jackson’s Art supplies for about $25. Money worth spending. I will have it forever. Every few months I tip all the dirty oil and slurry into a jar to bin, and give it a very thorough wipe out with plenty of paper towel and refill with clean baby oil. Safe and cheap baby oil, try it…about $5 for a litre at the supermarket. Yep, that’s what it’s called! ‘Incredible brush cleaner’ and that’s exactly what it is. After the baby oil process, I use this cleaner to give my brushes a final clean. I pour a very small amount into my cupped hand and work the brush hairs gently into it, using a swirling action. Then I rinse the cleanser out with warm water. It removes all traces of oil and paint and leaves the brushes beautifully clean and softened. This product is amazing for revitalising neglected or old brushes. It will break through hardened oil paint or acrylic, even gesso and house paint. I leave it to soak into my gesso brush for an hour or so, then clean and rinse with warm water. Using this process, I have had the same gesso brush for over two years and it’s still beautifully soft. I buy a litre bottle and then decant an amount into a smaller 250ml bottle to make it easier to use at the sink with wet hands. A litre lasts me about 6 months. Totally awesome product! Available at Jackson’s Art Supplies in Perth for about $30. 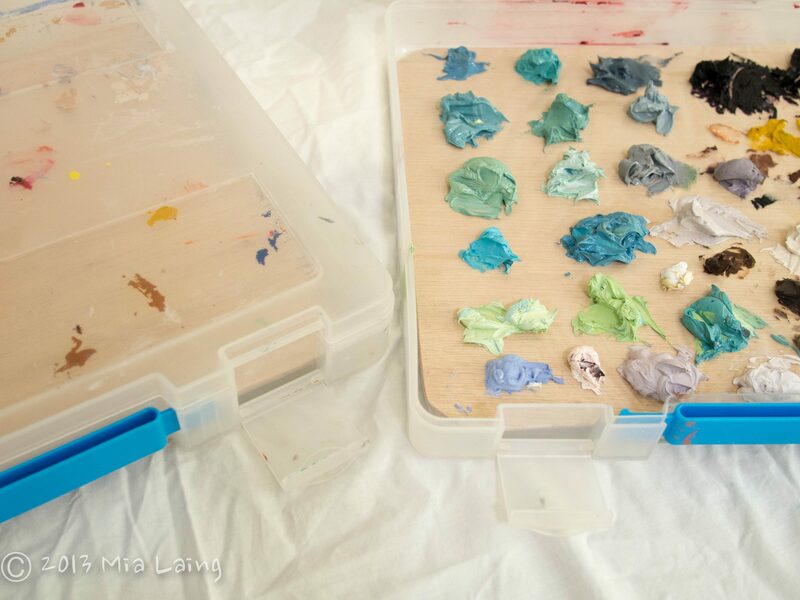 I use a plastic carry case, designed for holding a sheath of paper, as a freezer palette. This may take some explaining! Oil paint air dries. To prevent the drying process, excess mixed paint can be stored in the freezer indefinitely. I (try) to mix enough of some colours, that they will last me for the duration of a painting being completed…days, weeks or sometimes months! This is especially good for skin tones or blacks or colours you know you will use a lot of. I have a piece of thin (3 ply?) wood, cut to the size of the plastic container, which I then cover in freezer paper and masking tape to hold it in place. The excess paint then gets put in small mounds on this, the lid closed and it slides into the freezer, all ready for another paint day. Voila! I have three of these trays…and a whole shelf of the freezer to myself! I keep the excess paint from my previous one or two paintings just in case I find bits I want to change or touch up…there is nothing worse than trying to remix the exact colour after a painting is finished. Not fun. Freezer paint palettes save the day. I bought mine from ‘Officeworks’ for around $3.50 each. 5. A4 Laminator – Office Supply shops. I print off two A4 reference photos for my paintings…one I leave as a normal photo, the other I laminate. The laminated photo I use to check colour mixing and tones and I leave it next to my palette. The Laminating allows for paint to be placed directly onto or next to a colour on the photo and can then be wiped off. It’s very glossy though, so I prefer to hang the normal, unlaminated photo over my canvas to paint from, without being distracted by glare. Laminators are available to buy from any office supply shop or, in Perth, at the Post office. $20 and a few dollars more for the laminating pouches. I also laminate important reminders to my self in my studio…such as ‘SQUINT YOUR EYES!! !” and colour charts and tone scales. 6. Almond and chocolate coated licorice bullet snacks – any supermarket. LOL – I like my snacks! I keep a packet of almonds in my studio – at all times! There is nothing worse than being in “the zone” and getting distracted by hunger or flagging energy levels…these two snacks, plus some water can allow me to push through some low patches. 7. My camera – SAY NO MORE!!!! Any camera…just use it! Especially at ‘Golden Hour’ 4.30-5.30pm…divine, warm sparkly light! I could go on…and on, but that’s enough for today! Maybe I will do a follow-up with some more ideas from you guys? Tell me your brown paper package favourites people! BTW – ‘Sunny Girl’ was SOLD at the Royal Show during the week!!!! Yeah! 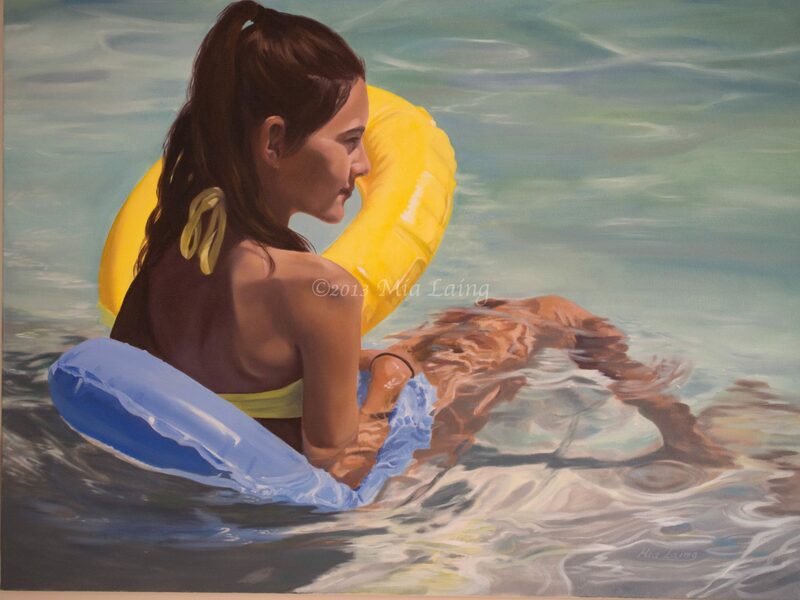 Bought by a lady who was reminded of her, now grown, daughter when she was younger…that’s why I paint. To tell stories, to provoke memories and stir emotions. Happy Gal. Looking forward to your favourite things…to do with whatever you love…Writing, photography, candlestick making…fire away my friends…I’m waiting!! Also, I have a question: how do you get your signature watermark on your photos? Is that through PicMonkey? Hi Louise, I watermark in lightroom as I export. There is also an ap for Mac called watermarker which is fine too. Very art orientated post this week…except chocbullets cross any borders!!!! You are most welcome! We all need little tips every now and then to help with the art flow. Enjoy! Next Welcome to Spring – Photo Style!